Smokey Bear has been a national icon since 1944 and has had a Twitter icon since 2010. 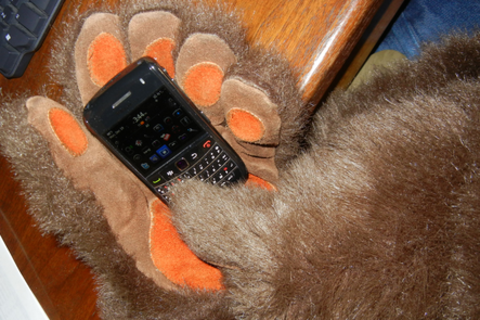 Meet Smokey and the man behind the bear's tweets. While Smokey usually reminds folks that only you can prevent wildfires, in this session he'll help you see how you can build a social media wildfire, responsibly. Learn how staying in character is critical to improving the quality of your connections and interactions and get a better sense of how you can make a legacy brand relevant today. Attendees will walk away with 7 tactics that will revolutionize their communication strategy through social storytelling and create social good through social media at the same time. All attendees will also receive free bear hugs. As VP of Public Relations and Social Media for the Ad Council, Ellyn promotes the non-profit and its 50 public service advertising (PSA) campaigns to the ad, media and philanthropy communities, as well as the campaigns’ key target audiences and the general public. Ellyn manages both press relations and social media outreach conducted on behalf of both the Ad Council and its campaigns. She also counsels Ad Council campaign managers and the organization’s non-profit and federal government agency sponsors on public relations and social media activities and opportunities designed to extend the reach of the campaigns, including special events, targeted press outreach, satellite TV and radio media tours, blog outreach, word of mouth marketing and social networking site engagement. Before joining the Ad Council in July 2001, Ellyn worked at Middleberg Euro RSCG where clients included Lending Tree, Western Union and Reuters. She has also worked at Baker Winokur Ryder, a division of Ogilvy & Mather, which promotes celebrity talent, and at USA Networks. Ellyn is a graduate of Penn State University and resides in Manhattan. She currently serves on the American Cancer Society’s Communications and Marketing Advisory Board and the board of the Penn State College of Communications Advertising/PR Alumni Network. Michael Bellavia is an Emmy winning producer and digital marketing executive. As the President of both HelpsGood, a social media agency, and Animax, a production company, Michael is a digital entrepreneur who has grown multiple companies from startup to profitability. Launched in 2011, HelpsGood http://www.helpsgood.com uses social storytelling to help brands connect and engage with their audience. The agency provides social media marketing services to brands, nonprofits and government agencies including the Ad Council, The Shelter Pet Project, American Heart Association, Bedsider, Healthy Lifestyle Choices and the US Olympic Committee. Michael helped the FWD campaign achieve over 117 million social shares in a single day to address the crisis in the Horn of Africa – the highest level of interactions in Ad Council and USAID history. Since 2010, he has led the social media efforts for Smokey Bear, the wildfire prevention icon. For the past decade, Michael has also been the President of Animax Entertainment http://www.animaxent.com, a multiplatform production company that produces television and interactive entertainment. A winner of the first broadband Emmy Award, Michael has produced television series, games, apps, sites and other creative technology solutions for Disney, ESPN, Bravo, Fox, MTV, NBC and Scholastic. Michael has an MBA from Columbia Business School and a BS in Engineering from The University of Michigan. He is on the Board of Delegates of the New Media Council of the Producers Guild of America and has spoken at NATPE, Digital Hollywood, CES, AdTech, OMMA, KidScreen, CTIA and the Economist Media Convergence Forum. Smokey Bear has been an American icon since 1944 when he debuted on a wildfire prevention poster. Sixty-seven years later, Smokey is an enduring symbol of wildfire prevention, with his image and popular slogan, “Remember, Only You Can Prevent Wildfires.” His message about wildfire prevention has helped to reduce the number of acres lost annually by wildfires, from about 22 million in 1944 to an average of 6.5 million today. Although progress has been made, wildfire prevention remains one of the most critical environmental issues affecting our country. Many Americans believe that lightning starts most wildfires. In fact, on average, 9 out of 10 wildfires nationwide are caused by people and, in most cases, accidentally. Smokey seeks to continue to decrease the number of human-caused wildfires and encourage young adults to speak up when others are acting carelessly with fire. Over the last 67 years media outlets have donated more than $1 billion in time and space for Smokey’s Wildfire Prevention campaign across television, outdoor and print. And now Smokey's also gone digital with his website http://www.smokeybear.com, social media profiles on Facebook, Twitter and YouTube, and a mobile app, enabling him to develop a deeper level of engagement with a new generation of fans. Smokey Bear is administered by the United States Forest Service, the National Association of State Foresters, and the Ad Council. Smokey Bear's name and image are protected by U.S. federal law, the Smokey Bear Act of 1952.